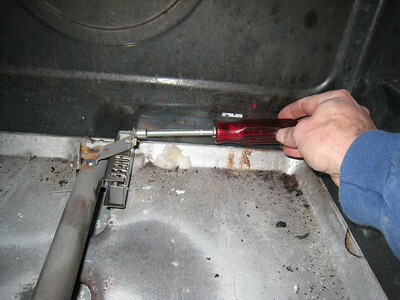 If your gas oven isn’t firing up, start your diagnosis by checking the ignitor for the proper current draw. “Uh, do what?” you ax, with glazed eyes. Don’t be intimidated by techie-sounding procedures. This is simple stuff– if you can fog a mirror, you can measure current draw. 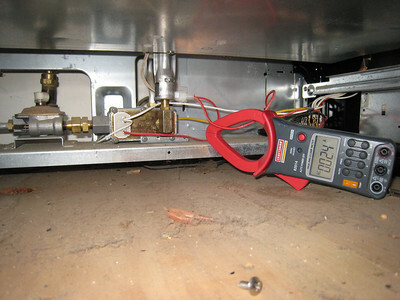 This article explains how to make simple electrical measurements and this one explains what you’re looking for in the gas oven ignitor. Once you’ve proven that the ignitor is drawing insufficient current (and, therefore, is the correct part to replace to fix the problem), use this handy pictorial guide to hepya change it out. 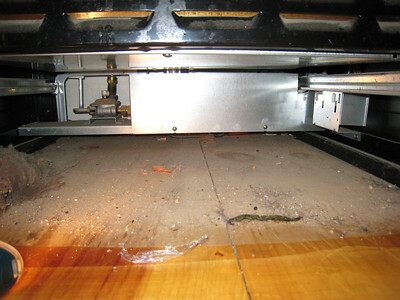 The wiring for most range ignitors is accessed underneath the oven by removing the pots drawer, as shown here. Why do you need to access the wiring? Two reasons: 1) so you can measure the current draw and 2) it’s part of replacing the ignitor since the new one has to be wired in the same way as the existing one. Take note of where the wires go. The ignitor wires are not polarity-sensitive so don’t worry about “reversing” them. 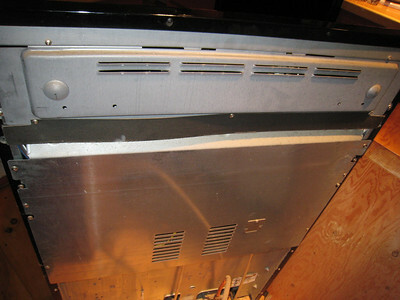 In this particular range (a Maytag), I had to remove a covering panel to expose all the wires. 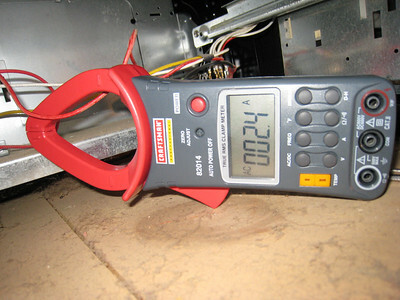 Here, I have my clamp-on ammeter on one of the ignitor wires to make a current draw measurement. You can see the closeup of the meter in the next pic. You can see the current draw reading is 2.4 amps. For a square ignitor, such as this one (you’ll see it in a subsequent picture), the minimum acceptable current draw is 3.4 amps, well above what I’m measuring here. Obviously, in order to make this measurement, the oven has to be turned on and the ignitor getting voltage. This is a LIVE test, meaning there’s live voltage on the circuit. Fire in the hole! Fry yo ace if’n you ain’t careful, Hoss, so… BE CAREFUL! On some ranges, you’ll need to remove the back panel to get to wiring for one or both ignitors (there’s one each for bake and broil). Yes, this means the range needs to be pulled out from the wall. In the case of a wall oven where the freakin’ engineers didn’t bother to make it service-friendly, you’ll need to remove the entire wall oven from the cavity. If this is the case with yours, you’ll quickly understand why I abhor wall ovens. 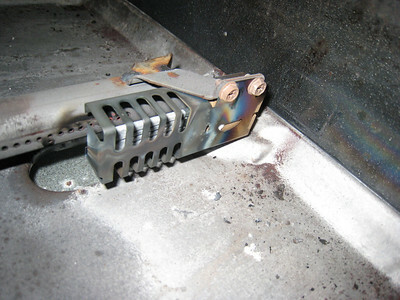 Here’s a typical bake ignitor. Note that this one is square. Some ranges, such as older Whirlpools and GEs, use a round ignitor. These two types of ignitors have different current draw specs and are made to be used with different types of valves. This means they are not interchangeable. So, if your range uses the square ignitors, you can only replace it with another square ignitor. The brand doesn’t matter since, by convention, all square ignitors have the same current draw and all round ignitors have the same current draw. 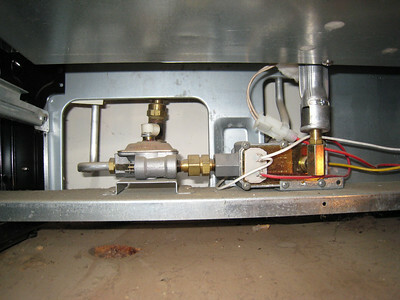 For replacement square ignitors, I find that the Maytag universal square ignitor kit is the most cost-effective and reliable. I use this kit in all brands that require a square ignitor. Sometimes, the head breaks off one of the ignitor retaining screws or, worse yet, the retaining screws are phillips screws and they wallow out on you. That’s what we call a Plot Complication (PC). A PC can be any event that results in the failure of the voluntary nervous system to contain a spontaneous convulsion of the autonomic nervous system as it spews voluminous streams of choice adult language, causing any casual observers present to wet themselves uncontrollably. 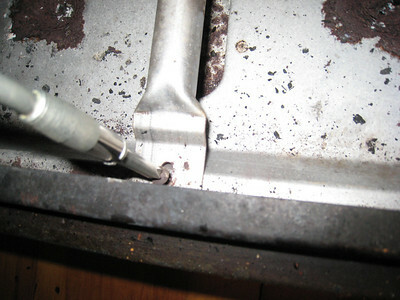 I can usually work the screw loose using my little channel lock pliers on the threaded of the screw. I’ll then replace the screw with a slightly bigger diameter machine screw with a pointed end and course threads so it cuts itself into the bracket. It ain’t gotta be perfect or purdy, all it’s gotta do it securely hold the ignitor in position. 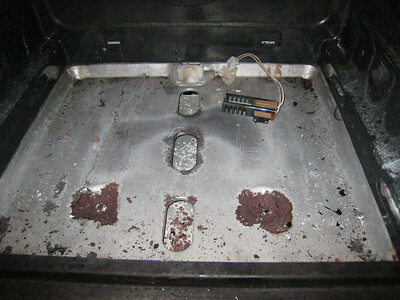 Here’s the bottom of the oven, with the bottom pan, flame spreader, and burner tube all removed so we have unencumbered access to the bake ignitor wires. On this range, I also removed the broil burner tube and the broil ignitor is left dangling, just itching to be replaced. Again, on this particular range, and maybe in the one you’re working on, you’ll have to remove the back panel behind the range. 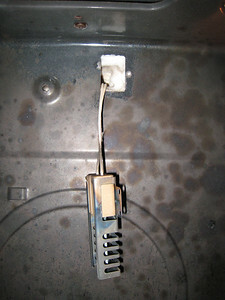 Shown here is the wire harness connector for the broil ignitor. 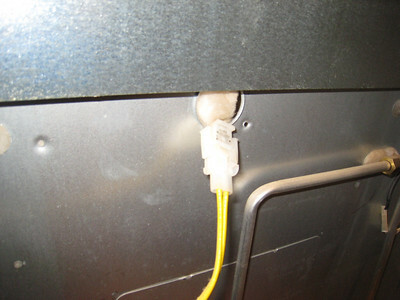 so you just need to connect the new ignitor wires to this harness connector– no need to go all the way back down to the gas valve, like in the bake connector. So, there you be, Buddy-ree. Easy as pie and 1-2-3. If’n you need parts for your range, come buy ’em from me. Merci! 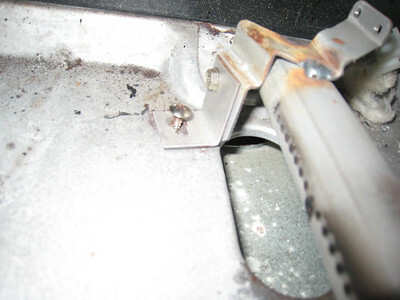 This entry was posted in Oven Repair, Range Repair on August 6, 2008 by Samurai Appliance Repair Man. In removing the old igniter, I cut the wires very short, so I had to buy another one. The moral of the story is always visit fixitnow.com before you attempt to fixit yourself. Next time, I will be ordering my Maytag parts here also. I had a similar problem to Doug. We have a GE stove (12 yrs. old). In my haste to fix the problem I changed the Broiler ignitor, unfortunately this was the wrong ignitor. The wires were cut long more by accident than planned out. The old ignitor was switched back to the original location. This was relatively easy because of the access. I took the new ignitor and disassembled the oven ignitor. One screw that fastened the bake burner was removed. Of course the ignitor was screwed on the bottom of the the bake burner. My wife who has smaller hands and is more agile, from doing yoga, reassembled the new ignitor and we spliced the wires and the ignitor glowed and Voila, we had fire. My advice is spend some time reading Samurai repair stuff and identify the broiler and oven ignitors and actually save time in the end. Maybe I will remove the bake burner the next time.